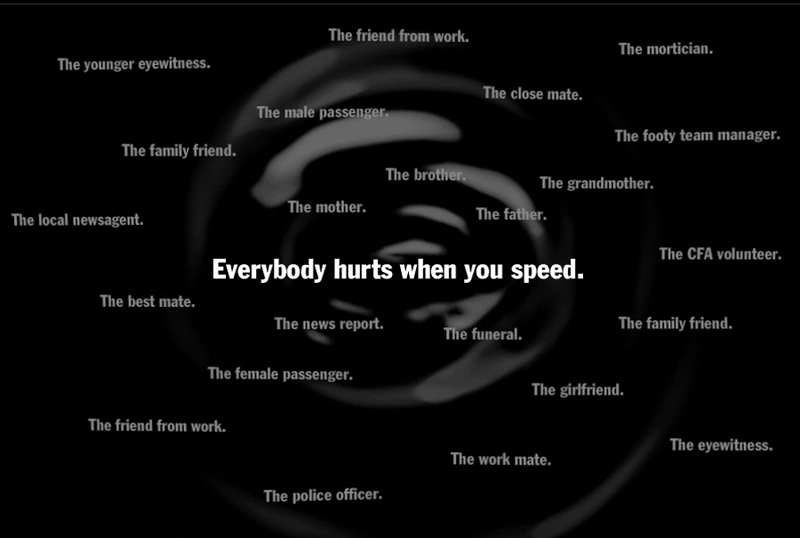 The Ripple Effect, a road safety advertising campaign commissioned by TAC, the Victorian government Transport Accident Commission in Australia, has won a Bronze Integrated Lion at Cannes International Festival of Creativity. 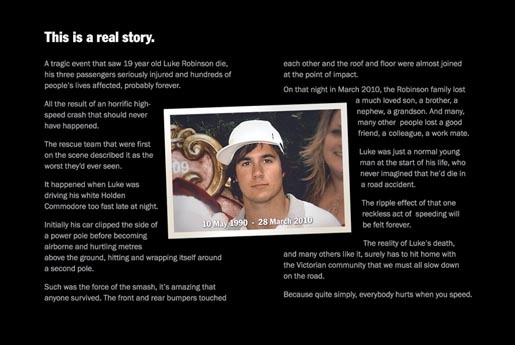 The campaign, run in July 2010, addressed speeding among young drivers through the real story of Luke Robinson, who died on March 28th 2010, became the centre of ‘The Ripple Effect’. The unifying thought was ‘Everybody hurts when you speed’. The campaign was composed of 26 stories from the actual people who were affected: from immediate family, workmates and passengers in the car to the local newsagent, emergency services and the mortician. The Ripple Effect campaign began with a press ad that explained why Luke’s family wanted to be involved. Then sixteen apparently unrelated stories appeared on TV over two weeks. Simultaneously online advertising, that looked like editorial and carried no branding, drove people to a dedicated microsite, everybodyhurts.com.au, providing access to 26 stories. Outdoor advertising built awareness of the central theme. After seeing a couple of stories on the microsite, the viewer was taken to a new Facebook application. It captured the person’s friends at random as on the initial landing page, bringing immense personal relevance to Luke’s story. They could forward videos and comments. After two weeks, press and online advertising announced that the stories would be brought together in a three minute commercial roadblocked across all TV stations. That day there was a formal launch by Victoria’s Transport Minister. 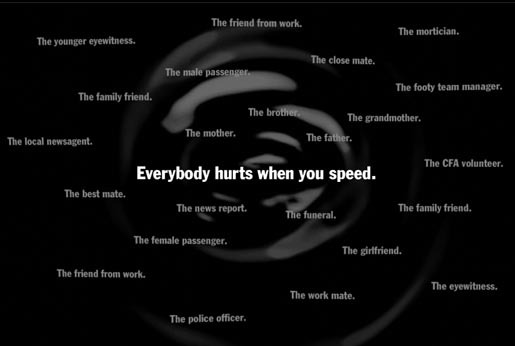 The TAC believes that the ‘Everybody hurts when you speed’ campaign is the most successful integrated campaign it has undertaken in its 20 year history. The microsite received over 100,000 hits in three weeks; it also had nine times the number of likes and comments for similar campaigns. Awareness of the campaign hit 82% after two weeks. The road toll in 2010 was a record low of 287. This is against an environment of an ever-increasing number of drivers on our roads and the prospect of ongoing communications waning in its effect over time. The campaign generated over $1,500,000 worth of coverage and is still frequently referenced. TAC and Grey Melbourne created a 20 minute educational video for schools and have provided Norm Robinson with a launchpad for his campaign directed at young people at risk of what happened to his son. The Ripple Effect campaign was developed at Grey Melbourne, Australia, by executive creative director Ant Shannon, creative director/copywriter Nigel Dawson, art director Peter Becker, agency producer Sandi Gracin, account director Randal Glennon, interactive designer Nick Sayer and developer Anthony Wymond. Filming was shot by director Mark Molloy via Exit Films, Melbourne, with producer Wilf Sweetland and directors of photography Adam Arkapaw, Germain McMicking, Ryley Brown and Ari Wegner. Editors were Rohan Zerna, Peter Sciberras and Jack Hutchings at The Butchery. Sound designer was Phil Kenihan, Front of House.